Today, Jordan got up early to go to work and I slept in until, like, 10:30. It was ridiculous. I just laid in bed and cuddled with the kitties and it was a beautiful, beautiful way to spend my morning (albeit not very productive.) Eventually, I got up and cleaned the house, which included going through my dresser and closet and pulling out all my winter clothes to put in storage. I also pulled out some stuff I no longer wear and put it aside for the thrift store. Fun! After all that was done (and the dishwasher was gurgling happily) I started my project. If you didn’t figure it out from yesterday’s clues, I wanted to make a big bag. 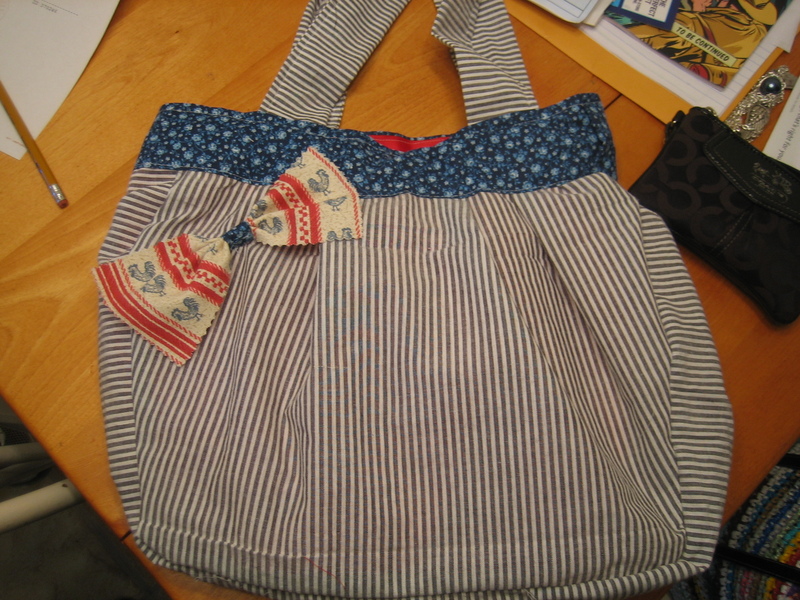 I followed this design for the size and shape of it but deviated for the straps, bow, and border. 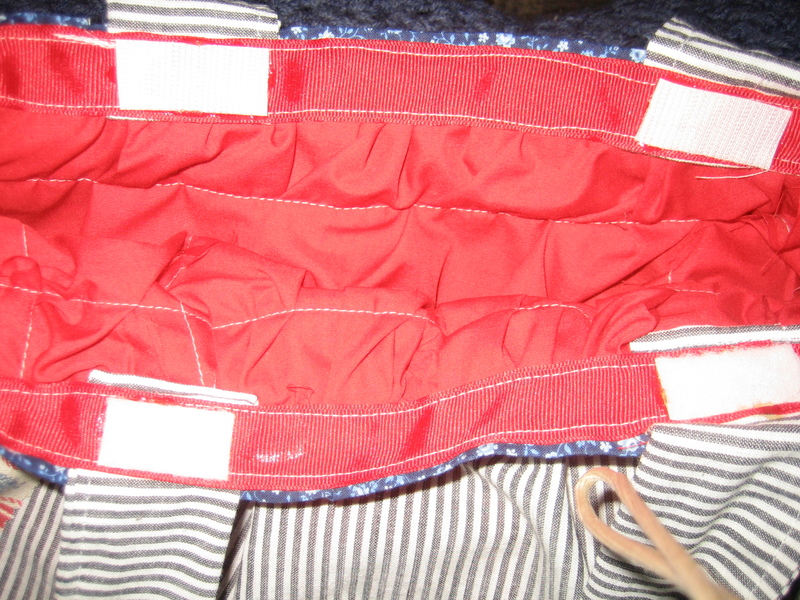 First, I sewed the outer shell sides together, with a long strip for the bottom of the bag in between them. Then I took a break and visited Jordan at work (where I got a free sugar cookie because I was wearing green!) When I got back, I followed the same steps with the lining fabric. 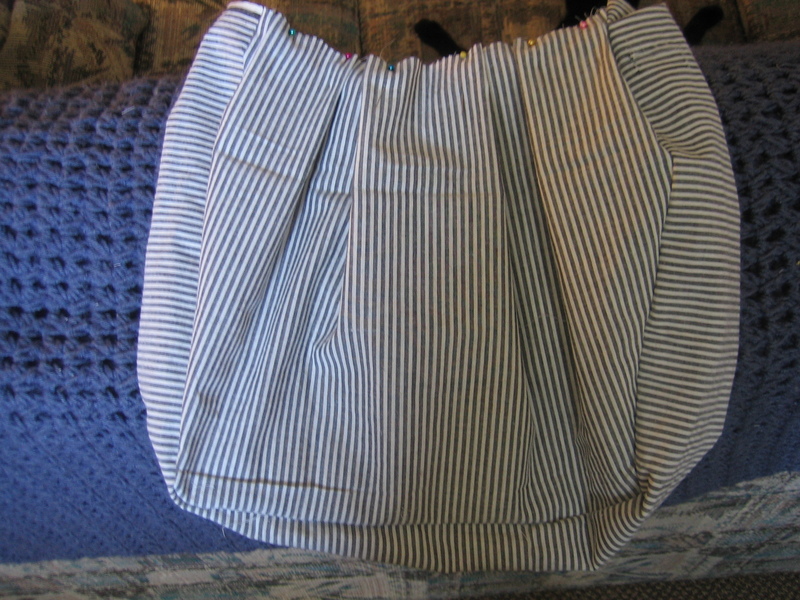 Next, I added the pleats to the outer shell. To make the lining fit inside the bag properly, I ran a long basting stitch around the whole thing, then pulled one thread so that the fabric would gather. 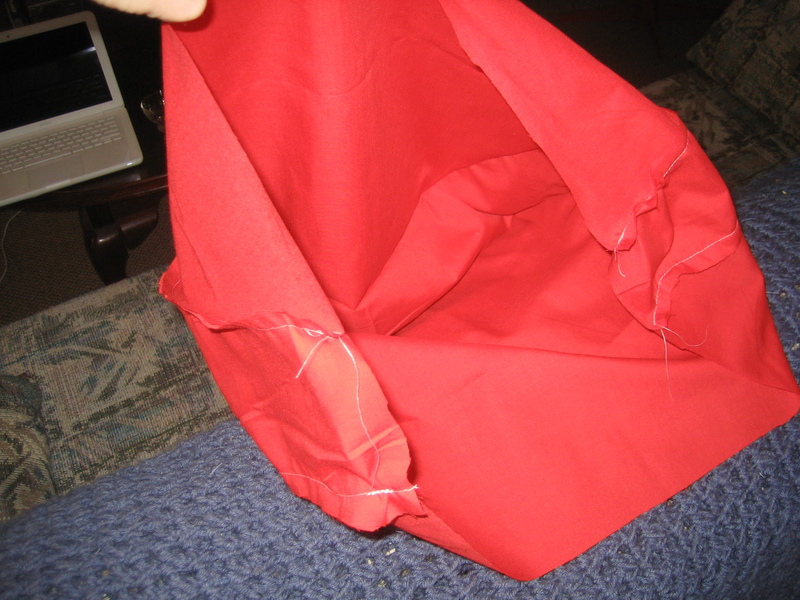 I stuck the lining in the bag and pulled the thread until both the outer shell and the inner lining were the same size. Next, I sewed on the straps. My straps are wider than those on the original pattern because I like the wide, casual look. 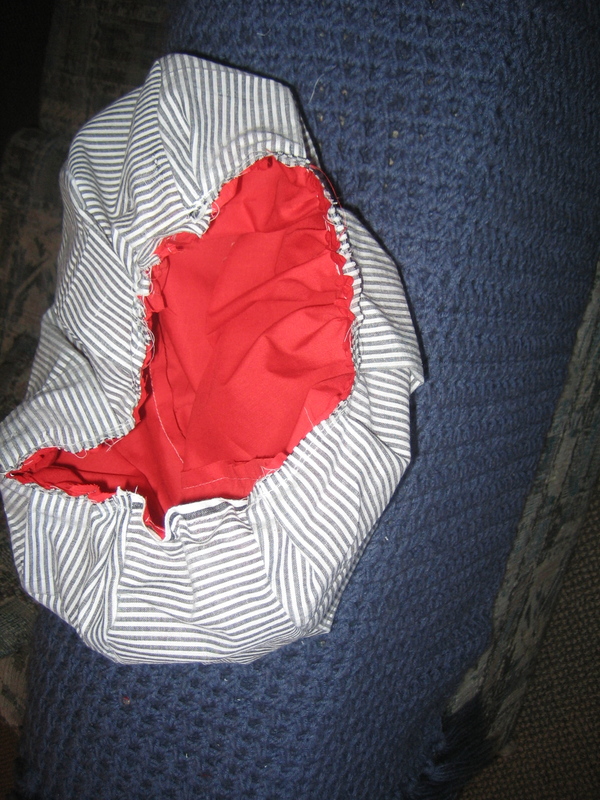 If I had read ahead in the tutorial, I would have hemmed the top portion of the bag before doing this. 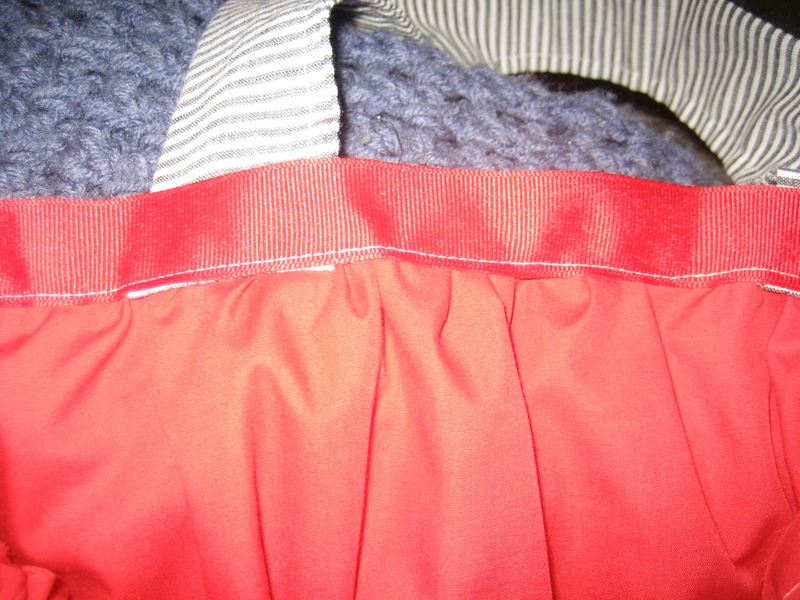 The original bag doesn’t need it because the final border is attached in two pieces that encase the unfinished hem. I had not planned on doing this (hence me putting the straps on early) but then I realized I’d have to do something to cover the exposed edge. 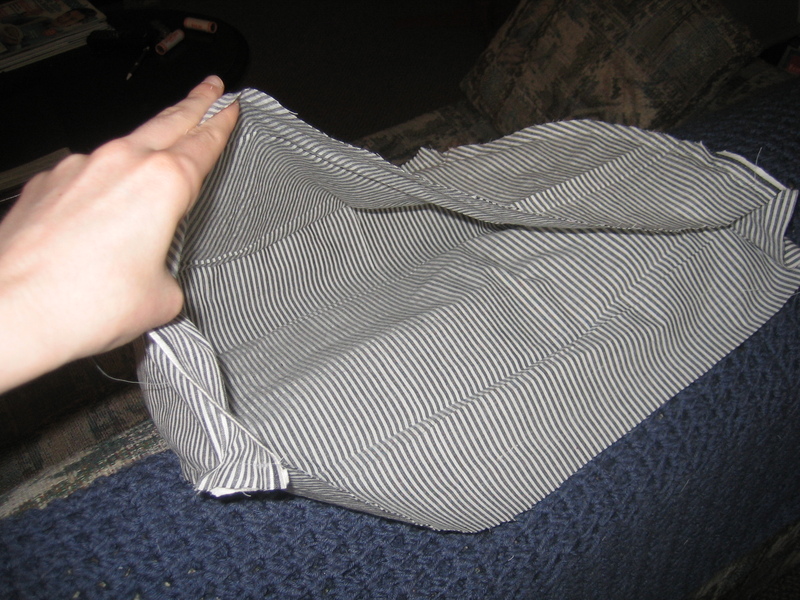 If you look closely, you’ll see that I accidentally inserted the lining the wrong way so you can see all the seams. I was a little bummed out but there was nothing I could do since I didn’t notice until I was almost done with the whole thing. C’est la vie! Craft 20 of 52: Complete! 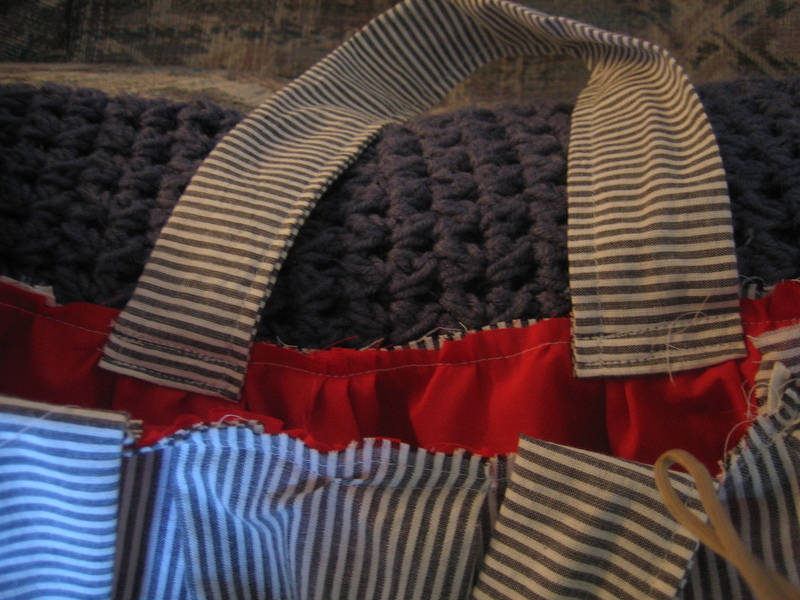 I really enjoyed doing this bag because 1) I’d never made a bag before and 2) I learned a couple new things! For instance, ironing your pieces before you sew makes a HUGE difference. I ironed the straps and border piece and it just made everything look nicer and more professional. I think I’ll take this bag with me to Florida because it will fit my books and whatnot for the plane ride! Hope everyone is having a fabulous St Patricks Day. Enjoy some Irish Soda Bread for me! Very nice! I love bags. I LOVE the bag you made yesterday! Another clever project. Where do you come up with all of these wonderful ideas? Such a talented daughter-in-law I have. So proud of her!! Adding velcro on the inside was a fantastic idea!! I’m glad you enjoyed making the bag it turned out great!